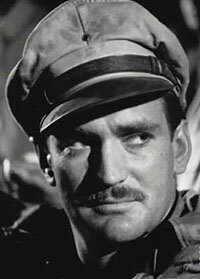 Rod Taylor plays Jack Janiero -- an American -- in his first role in a full-length feature film. This Australian production starred ever-popular Aussie Chips Rafferty and was a box office success. 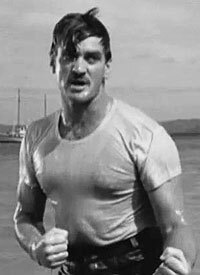 Rafferty plays Ted King, a pearler who lives on Thursday Island, the center of Australia's pearling industry. When King discovers a body floating in the Torres Strait, the clues lead him to a gang of crooks who are smuggling migrant workers onto the island. Determined to get to the bottom of the mystery, he is joined by his first mate, Janiero; his daughter, Rusty (Ilma Adey); and Peter Merriman, the heroic owner of the pearling company. Merriman is played by Charles "Bud" Tingwell, who worked with Rod during his radio days. Rod also had previous experience working with the director, Lee Robinson, on radio programs. 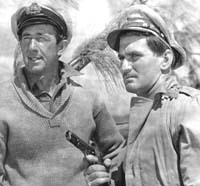 Robinson began teaming with Rafferty on feature films during the 1950s. But at the time, he was inexperienced as a movie director. In his book, "Rod Taylor: An Aussie in Hollywood," author Stephen Vagg quotes Robinson as admitting. "As far as performance was concerned, Rod had more guidance from Chips and Bud." Furthermore, Vagg notes, that Rod "was allowed considerable creative input behind the scenes -- rewriting portions of the script, having input behind the scenes, even directing some sequences." Robinson may have written the part of Jack Janiero with Rod in mind. Whether he did or not, the role is a perfect fit: a tough guy with a tender side; a roustabout who is responsible, hard-working and loyal. The movie was a financial and scenic success. ScreenSound Australia called the movie "a dashing and romantic thriller shot in the beauty of the Barrier Reef Islands." 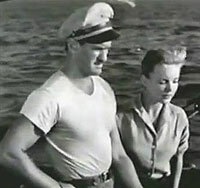 The film is indeed notable for its spectacular sequences of underwater camera shooting, including a fight scene that occurs in about three feet of water just off the shore. Three weeks after editing was complete, "King of the Coral Sea" had made its money back in overseas sales and proceeded to do well in the Australian market. by Graham Shirley and Brian Adams, 1983. Taylor's film debut, however, came at about the time the Australian feature film industry was withering away. The growth of television in the United States was cutting down on the demand for the kind of movies Robinson and his brethren were making. Meanwhile "visiting" productions -- films made by overseas companies -- were on the rise. One of these was a co-production by Twentieth Century-Fox and Treasure Island Pictures -- "Long John Silver," the film that sent Taylor on his way to Hollywood. AustralianScreen: Includes curator's notes and video clips (see list, below). Clip 2: Just a glimpse of Rod. Clip 3: Rod's fight scene.